When is a cat not just a cat? When it is being used as an example of digital literacies. Digital literacy has been an increasingly-debated and discussed topic since the publication of Paul Gilster’s seminal Digital Literacy in 1997. It is, however, a complex term predicated on previous work in new literacies such as information literacy and computer literacy. To make sense of this complexity and uncertainty I come up with a ‘continuum of ambiguity’ and employ a Pragmatic methodology. This thesis makes three main contributions to the research area. First, I argue that considering a plurality of digital literacies helps avoid some of the problems of endlessly-redefining ‘digital literacy’. Second, I abstract eight essential elements of digital literacies from the research literature which can lead to positive action. Finally, I argue that co-constructing a definition of digital literacies (using the eight essential elements as a guide) is at least as important as the outcome. The book comprises nine chapters. The first is an introduction, which explains how the remainder of the book is structured and suggests paths through it. Chapter 2 attempts to define the problem this book addresses. Doug explores the ideas of ‘digital’ and ‘literacy’ (in reverse order) and the reader learns to replace the concept of literacy with literacies. Chapter 3 stresses the ambiguous nature of such ideas, arguing that this ambiguity should be actively embraced rather than avoided. Models of digital literacies are critiqued in chapter 4, with an alternative – Doug’s eight Essential Elements of Digital Literacies offered in chapter 5. The rest of the book tries to apply this framework. Chapter 6 uses memes as an way to understand digital texts. The next chapter looks at remixes (with a brief nod to copyright) and chapter 8 (perhaps unsurprising given Doug’ s current work at Mozilla) looks at coding the web. The final chapter provides a conclusion and encourages the reader to rip and remix the book. Doug manages to draw a lot of ideas together in his book – we travel from the invention of the printing press to the World of Warcraft. He blends ideas from academic disciplines – education, linguistics, history, computing, philosophy – with everyday life – gaming, cooking, even furniture. The result could be a terrible pastiche, but it is not. Doug avoids this by weaving the thread of digital literacies through the book, thus demonstrating the value this lens can provide. Some chapters are flagged as skip this if you like, but I think they are accessible enough and worthy of reading. Some sections (such as the challenge to the requirement for linear progress in education) leave you wanting more (note this is not necessarily a criticism). A real strength of the book are the well-chosen examples used throughout – no technical knowledge is assumed. To illustrate the potential confusions around copyright Doug uses the concept of recipes (yes, as in cooking) and he derives an enormous amount of meaning from an ugly looking baby* and cheezy cats when analyzing internet memes. In summary, The Essential Elements of Digital Literacies is a short, informative book written in a clear, often amusing style. If I was being really picky it could probably benefit from one less font, but that is a minor criticism and does not detract from the thoughtfulness of the debate. I think it is one of those books that cannot be read widely enough and I recommend it to anyone. Reading it will not instantly make you digital literate, but it will give you an understanding of why this is important and offers a framework to help you reflect on your own practice and that of others. I spent today in Edinburgh at a presentation about Canvas – a VLE by the strangely named company Instructure (it doesn’t exactly roll off the tongue). To declare a potential interest, I currently work for an institution that has a long history with a competitor – Blackboard. I leave it to the reader to decide whether/how that colours my comments. A large part of the day was spent listening to staff not sales people – Darren Marsh and Margaret Donnison from Birmingham University which has recently been through the periodic VLE review process that every educational institution undergoes from time to time. In Birmingham’s case, their current VLE (WebCT) had gone ‘end of life’ and so they were facing a migration regardless of which product they chose. In that sense it is an excellent example of an unbiased evaluation, as there was no status quo option. On the down side, WebCT is pretty long in the tooth and would fare poorly in a comparison with almost any VLE on the market today. That last point is interesting – in a market dominated by a small number of vendors, is there a risk that all institutional offerings look the same? This is an intriguing proposition that I have some issues with – is the online learning experience only skin deep? Equally does just changing the appearance of content (akin to applying a different template to a WordPress site) significantly alter the learner’s experience in any meaningful way? That doesn’t fit with my experience. I think the MOOC I learnt most from so far was the #OCL4Ed course hosted on WikiEducator/MediaWiki. It looked awful and was hard to navigate, but the learning activities were well-designed and stimulated meaningful collaboration amongst the participants (e.g. commenting on each other’s blogs – see http://apperleyrd.wordpress.com/). A question I didn’t think to ask at the time was where had this notion of distinctiveness come from? Was it requested by academics, tired of working in the same old online courses, was it from students, or perhaps from marketing? I have seen a lot of student feedback describing institutional VLEs as ‘clunky’ and ‘tired looking’ but I’ve never seen any students asking for them to be more distinctive! The findings of Birmingham’s detailed tender process were echoed in the subsequent demonstration of the Canvas product – there is a large feature set common across all the major VLE platforms. We saw demonstrations of online marking using the cloud Crocodoc/Box View service, adaptive release of content based on dates and tests scores, integration with third party services such as Kaltura, Panopto, YouTube. Whilst slick, these features should have been familiar to the audience and many required the purchase of third party services (e.g Kaltura and Panopto). Assignment workflow was a little disappointing, lagging behind that in Moodle or Blackboard – no support for moderated marking, anonymity and other factors held dear (even if perhaps in some cases misguidedly) by many UK HEIs. Great play was made of the ability to use the IMS LTI standard to connect to third party systems. They publish an impressive catalogue of possible integrations at http://www.edu-apps.org/index.html. A closer inspection shows that very few of these services have been certified as compliant by IMS (see http://developers.imsglobal.org/catalog.html), which makes me wonder whether they take advantage of the full range of LTI features (e.g. populating the grade centre) or are just a simple launch point that may or may not actually implement LTI. Later I browsed through a few entries on edu-apps and some of the comments about tools no longer working (including the YouTube integration) were a bit worrying – although in this case they might have just referred to integration via Moodle. Also, although IMS are working at a standard for analytics data – caliper – this is not yet ready to implement, so integrations that rely on LTI will not provide any tracking/usage data to the parent VLE. This is a missed opportunity for both staff interested in their learners actions in a given course and those trying to aggregate data across courses, or attempting to measure the return on investment in a particular tool. Interesting too that like many other VLEs, the ability to integrate with 3rd party systems using LTI first requires action by a user with appropriate privileges (see http://www.edu-apps.org/tutorials.html). Whilst the document suggests this can be done at a course level, in practice I think this may be restricted to system administrators – if only to keep the lawyers happy and to safeguard the privacy of our users – creating a potential bottleneck to innovation. Although only just coming to the end of their first year of using Canvas, Birmingham had found the time to solicit student feedback via questionnaires. The usual caveats about small sample sizes, risk of only capturing the extremes of opinion and questionable use of some leading questions all apply. Still 84% of students agreed with the statement that they found canvas easy to use, and an encouraging 88% found it useful for their studies. Perhaps more worrying is why 12% did not, assuming that it contains links to the course materials, online tests and e-submission! Common themes that the students praised were ease of use and a clean layout. Looking at Birmingham’s implementation (which provides a pretty standard canvas course) you can understand the ease of use – the interface is relatively uncluttered and the content is restricted to materials relevant to the courses they are taking. There was no evidence of any portal functionality being delivered through canvas – a later perusal of their website identified [my.bham] – a student portal based on SunGard’s Luminis product. The clean layout is an interesting comment. I’m not sure if this means ‘it looks like Facebook/Wordpress’ and just reflects the widespread adoption of this user interface model, or whether it was very like the old WebCT course structure they already knew? Screenshots showed templates with similarly labelled folders on Canvas, some even going to the trouble of replication the icons representing folders in WebCT. On a more positive note, it might be the result of carefully planned and structured courses on the new system. One advantage of switching learning environments is that it offers the institution a chance to start again. It is all too easy for systems to become bloated over the years (like an old laptop) with content that is no longer used, courses based on copies of copies of copies, all of which can have a negative impact on performance. Also it provides staff with the chance to review the content and online components of their course. Doing this across a whole institution and with a real fixed deadline, where just using the same stuff as last year is not be an option, has benefits that can’t be achieved through an isolated course review (though I’m not arguing you should stop doing this either, there’s just an extra benefit/multiplier effect when everyone is thinking, talking and sharing about this at the same time). It’s also a good time to check all the links work, content is copyright cleared, etc. It is also a good motivator to get staff to attend training. Birmingham use a mix of face to face workshops with online materials – with separate courses for staff and students. Like many other vendors, they have released mobile apps for iOS and Android. I thought that the mobile UI they showed actually looked nicer than the standard one, with clear icons next to course menu buttons giving an extra clue to the functionality of the links . Special apps exist for dedicated tasks e.g. the SpeedGrader app for online Grading – which on a cursory inspection seems a bit like Turnitin’s GradeAnywhere app, though without support for offline marking of downloaded scripts. A few eyebrows were raised around the room when they mentioned their approach to versioning/software release: there is only one version. They operate an agile approach with new releases every three weeks. When probed, there is a degree of control, it is possible to turn off or delay the implementation of new features on your build. This is good news if you want to avoid any changes during key times (e.g. online exams) but seems to contradict the one version policy and I am not sure how it works with their online help documentation – does it respect all these local settings? The product is only available as a hosted service, sitting on the Amazon AWS cloud, providing a scalable solution, with a promise from Instructure (UK) of 99.9% uptime over a year – assuming it doesn’t fall foul of a denial of service attack by those angry about it’s approach to in-country taxation. They use the Dublin-based AWS European Data Centre for EU clients to keep everyone happy. It is unclear whether all the bundled extras – e.g. the Big Blue Button conferencing app – also offer an EU or -Safe Harbor compliant solution. Although Canvas’ origin lies with American computer science students dissatisfied with their current online experience (sound familiar?) the staff present in Edinburgh were keen to play the international card. It was good to hear them supporting localisation for different languages (no support for Gaelic yet) and with research and development teams available in-country – in the case of the UK in London. As one of the small fishes in a pond still dominated by the US, it is always nice to know that someone is listening and able to act locally. Although we ran out of time, they are also analytics options and Instructure staff were keen to hear from UK institutions wanting to use their Canvas network product to facilitate MOOCs (like #BlendKit2014). Q. Did the day leave me feeling that our current platform (Blackboard) was pedestrian or had been eclipsed? A. No – some features in Canvas look slicker/more mature/better than Blackboard, but equally some features in Blackboard look slicker/ more mature/better than Canvas. Q. If I was looking to implement a VLE from scratch or undergo a review of provision would Canvas be on my short list? No more writing on the wall? For the last ten years, electronic whiteboards – such as those produced by Promethean and SMART Technologies – have been standard items on any classroom refit and usually enthusiastically received by staff and students (see Smith, Higgins, et al. 2005). Every day when I drop my children off at primary school, they walk into rooms where the electronic whiteboard is up and running. Any parent who arrives late and has to take their child into the classroom is likely to see them all performing a 5 minute exercise routine following instructions on the board! For examples see this Pinterest site or the Activityworks website, the latter includes some explanations of why some people believe this approach is effective. My observations of whiteboard use in schools is very different to that in universities, where the boards now usually sit switched off (in some cases hidden behind larger projection screens)! Even in areas for group work – e.g. booths where students sit around a table with a laptop and an electronic whiteboard at one end – more often than not the whiteboard is unused. The question is why? This is a technology that showed a lot of early promise. A study by two staff at the University of Pittsburgh published in 2012 has caught the attention of SMART (in that they add a link of dubious legality to it on their website). Jang and Schunn watched the way groups of engineering students interacted with/were constrained by the technology. The authors contrast what they term “individual tools” such as a computer or a person’s notes, with “shareable/collaborative tools” such as an electronic whiteboard or a physical prototype. Their results suggest that students who used collaborative tools from the start, and continued to use them throughout the project, were more likely to deliver. There’s a bit of circularity here, and I don’t feel you can unpick whether the availability of the boards increased communication, or if it just shows that people who were already experienced at group communication made good use of the available collaborative tools. SMART certainly hope you take the former view as you can see in this infographic they published summarising the findings. Opinion remains divided – e.g. this 2010 study by Torff & Tirotta suggests that some of the motivation-enhancing effects often associated with electronic whiteboards are overstated. They are usually poorly placed in rooms (particularly “meeting rooms”) , meaning that many people sit with their back to the board and have to turn away from the rest of the group to see it. This has the effect of inhibiting conversation, or favouring their use in small groups. The worst example of this is putting them at one end of a table in a booth, making them essentially off-limits for everyone but the two people nearest the board. They are often too small, making the content hard to read and annotations blocky. Too often they are not as good as a plain whiteboard, failing even at the first substitution stage. If you are trying to project a high resolution image, often projectors aren’t up to the job – with neither the resolution or the contrast. Solutions that can make use of an LED or plasma TV can give much better results – digital versions of microscope slides can finally look as good as old Fujichrome slides! Pens and the erasers can go missing, and the on-screen tools you can drive with your fingers are always a bit clunky. Most boards only support one “touch” at a time. This means two people can’t really draw at the same time – which is something I’d hope would be a key part of collaboration. Users accustomed to navigating with multi-gestures on their phones and tablets will find the electronic whiteboard a frustrating experience. Suppliers are catching up, but I still think the model is wrong. The boards can do strange things with other USB devices connected to the same computer (e.g. blocking voting system dongles or some slide remotes). Collaboration tools should play nicely together in my opinion and not restrict you to the tools built into the board. The required software can be a bit flaky, and some versions are not as backwards-compatible as they should be. Furthermore, the developers seem to write the code where the tools are deployed using helper apps that launch on start up, do they really expect staff to always shackle their laptop to a whiteboard? Finally, and in my opinion the worst feature, is that they only work when you stand in front of them. If you fix them at a height where most people can reach both the top and bottom of the screen, then you probably won’t see much if there is someone sitting between you and the board. It is difficult to use them without turning your back on the rest of the room. Yes I have seen setups linked to an interactive tablet, but this still needs tethering via USB and so is rarely passed around the table. Perhaps in response to this failing, some boards are now available as “tables”. Whilst the videos of people flicking through and rotating photos look slick, I’m not sure this really is the action most conducive to learning in a tutorial or seminar setting. If the table becomes the screen then you can’t put things on it – what good is a meeting if there is nowhere to put your coffee cup? How will you take notes? Despite this list, I have seen people use them and use them well. By capturing a carefully designed “board-centric” activity, the focus of participants can shift from trying to record what is happening, to actually making things happen. That has to be a good thing. They also allow annotation of figures on the fly, which can help address any issues that were not anticipated when you prepared the materials. Whilst I was initially attracted by the large number of page templates, I think there is a danger of over-preparing the session. Students need to be free to contribute to the session and take it in a direction that, whilst still meeting the learning outcomes, may not be exactly what you had planned. I find that if I have spent a lot of time preparing particular slides, I am more resistant to deviating. That is wrong. I think the answer is probably to stop trying to write directly on the board. There have been a lot of advances in educational technology since the first electronic whiteboards were designed. The two key ones for me are the rapid growth and availability of wireless networks and tablets. Technologies such as Apple’s Airplay (sharing content from an iPad or Mac newer than mine via an AppleTV) are very slick and free you from the constraints of a single app/program (no matter how good it is). Connection is literally child’s play which should encourage staff and students to have a go. Rather than ask a student to come up to the board, or try and pass them a tethered tablet, surely it is better to get them to take control of the screen from their device. If someone wants to suggest a minor change, pass the tablet. That said, I think this model may be more suited to “serial collaboration” unless the app you are sharing support live collaboration (e.g. a wiki). The cloud is also changing things – if someone takes a picture with a phone or tablet (perhaps the result of a particular experiment, or something that illustrates a point they want to make), how easy is it to get it displayed on-screen? Do you need to swap devices, or is there some common repository (be it Flickr, Dropbox, OneDrive or iCloud) that you can use to facilitate instant sharing? 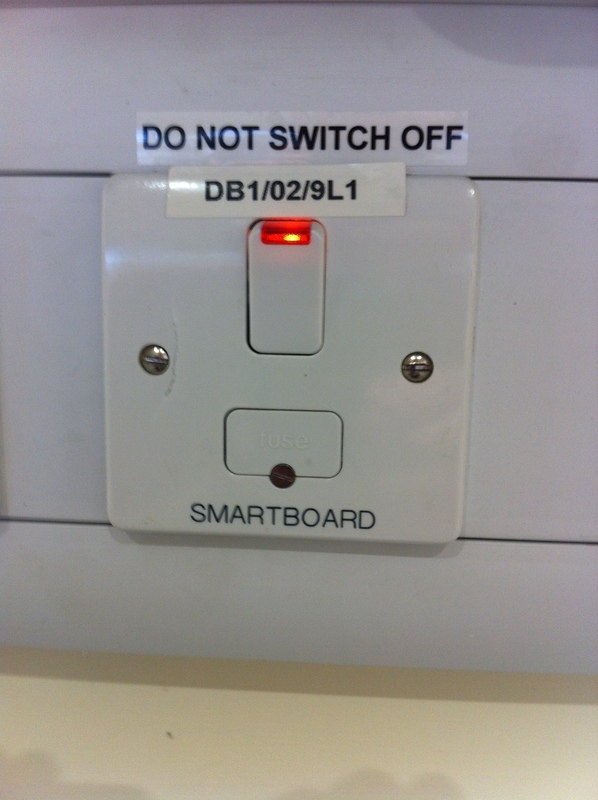 If we do decide to replace electronic whiteboards, it might mean we can finally get rid of switches like this one that are just asking someone to see what happens if you do!